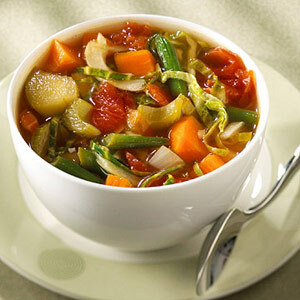 "Soup not only warms you and is easy to swallow and to digest, it also creates the illusion that Mother is there." Here's a photo of my "I was Just Cleaning Out the Refrigerator Soup." Mmm, yum... see recipe at the end of newsletter. The FAQ section is the place where the beautiful people hang out... earthy and raring to grow. Head on over and ask a nagging question... or answer another gardener's head-scratcher. Thanks to all those who contribute, and if YOU know something useful, I bet we'd like to know it too! Instead of using lots of salt on your nosh, which may be a risk factor for diseases such as stomach cancer... use healthier flavourings. Not only can turmeric, ginger, cumin and most of the green garden herbs replace salt, but they also bring their own positive effects to your health. More on herbs and spices... even if you're a meat eater as well as eating lots of plant food, you'll also find plants useful to help the body negate the effects of any high temperature meat cooking. Marinating meat in olive oil, lemon juice, garlic and herbs such as thyme and rosemary, eliminates nearly all of the carcinogenic molecules formed by cooking meat with high heat such as barbeques and grilling. There are a few good recipes on website, with a section on barbeque ideas. The answer is... well fed and watered vegetables growing healthily in rich garden soil. Now what's the question? The question is how best to combat early or late frosts. Strong plants can better withstand weather extremes and other problems like disease. In many plants, promoting soft new growth by feeding in autumn for example, will make them more susceptible to trouble. 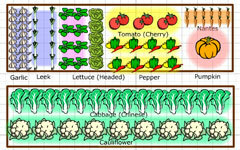 Want to know what vegetables to plant? Want to know when to plant them? The GroVeg Garden Planner is your answer. Click here for a 30 DAY FREE TRIAL! Thanks to Peter Schaller, who says "There's nothing better than a lazy Sunday morning to get life in order. This is what I made after cleaning out the vegetable drawer." Dice carrots and potatoes and simmer 5 minutes in covered pot with enough water to cover. Meanwhile dice all other veggies and smash garlic and dice finely, then add to pot. Add spices and seasoning to pot and cook approximately 15-20 minutes. Note: This ends up thick and chewy, but add more liquid if you like. I also added some fat to help absorb nutrients by swirling 1 Tbln coconut oil through the soup. Flavours are even more delicious after several hours or overnight.